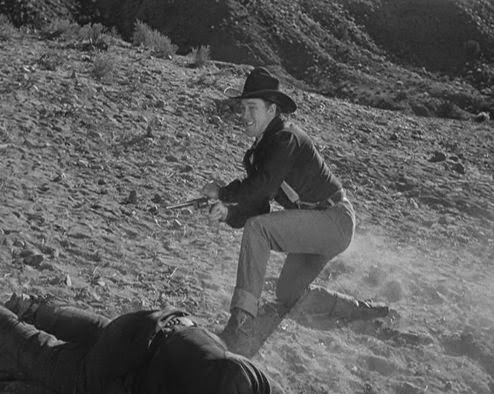 Ben Johnson in the climactic gunfight in Wagon Master (1950). · What was the first western you saw? · Who was your favorite western star? · How did westerns change over the years? · What did you most want to see when you finally had a chance to travel out west? · Did you see Wagon Master? Did you like it? At best, I can hazard a guess at what some of my grandmother’s answers might have been. What was the first western you saw? My grandmother, Maud Elizabeth Clem, was born in Luray, Virginia, located in the beautiful Blue Ridge Mountains (she’d want me to note that! ), in 1902. This means she was a baby when movies were in their infancy and she grew up right alongside them. 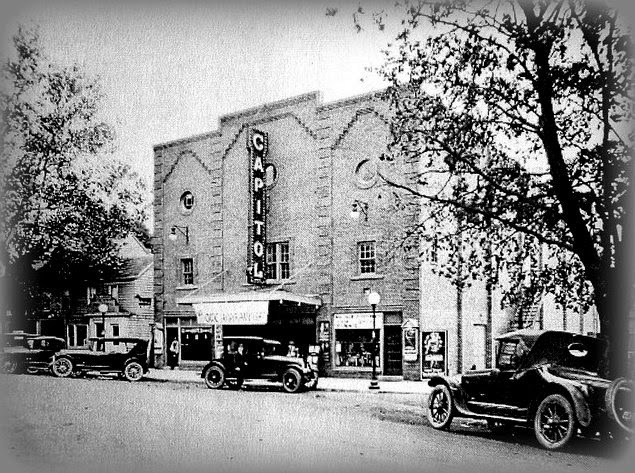 We know there was a movie theater in nearby Culpeper because my grandmother’s father worked as a projectionist there. And Theodore Carl Anderson, a northerner working in the south, accepted a part-time job playing trumpet in the orchestra, accompanying the silent movies. So I don’t think it’s much of a stretch to assume that this couple who would be my grandparents, Theodore and Maud, enjoyed some movies together in the Culpeper Theater in the early 1920s, prior to their marriage in 1923. In those days, she might have enjoyed the westerns of William S. Hart, Bronco “Billy” Anderson (doubtless getting a kick out of the fact that her beau had the same last name! ), Buck Jones, Hoot Gibson, and Tom Mix. But what I really want to know is what she thought of Harry Carey, early western star and father of Wagon Master co-star Harry Carey, Jr. Did she see some of 27 westerns that Carey made with a young John Ford, still in his twenties(! ), directing? Most are lost now. What might she have remembered? Salon is located on the site of the old Culpeper Theater. my grandfather played trumpet in the orchestra. Who was your favorite star? When you’ve watched westerns for more than fifty years, you can probably work through a lot of favorite stars. In the thirties, she would have followed the singing cowboys, the cowboy serials, and the long “b” western apprenticeship of John Wayne. When television came along in the early 1950s, she and her husband were among the first in town to buy a TV. The popular television cowboys were just fine with her, too. She liked them all. How did westerns change over the years? Movies were for fun. I doubt she noticed the changes as they slowly unfolded. She started going to movies in Virginia in the silent era, was living on Long Island when talkies became the new sensation, and was settled in Riverhead, New York, when they bought that first television. Life around her was changing fast, but to her, the westerns probably weren’t changing much at all. There were good guys, bad guys, and Indians; there were horses and wagon trains; and there were gunfights and chases. It was quintessentially American entertainment. What did you most want to see when you finally had a chance to travel out west? When they were in their 50s, my grandmother and grandfather embarked on their dream vacation, traveling west in a camper. They took a northern route, exploring the Rocky Mountains, Yellowstone, and Redwood National Park. They listened to lots of Johnny Cash on the radio and became big fans. A couple of years later, our family joined them for a similar trip, taking a southern route this time and visiting sites like the Alamo, a pathetic trickle of a Rio Grande, Tombstone, the Petrified Forest, and the Grand Canyon. I think my grandmother was the one really excited about the Alamo and Tombstone, and she would have been the one most disappointed in the Rio Grande, too. It looked so much bigger in the movies. Did you see Wagon Master? Did you like it? If a western was playing at the Riverhead Theater in 1950, chances are that Grandma saw it. She liked going to the movies, and she wouldn’t miss a western if she could help it. I bet she liked Wagon Master, too. After all, it had good guys, bad guys, and Indians; horses and wagon trains; and gunfights and chases. That’s more than enough to make a good western. Just settle back and enjoy. by TinselToes on the Cinema Treasures website. Naturally, when a western has two heroes (Ben Johnson and Harry Carey, Jr.), there are going to be two horses right there with them. In scene after scene, their horses provide solid support. 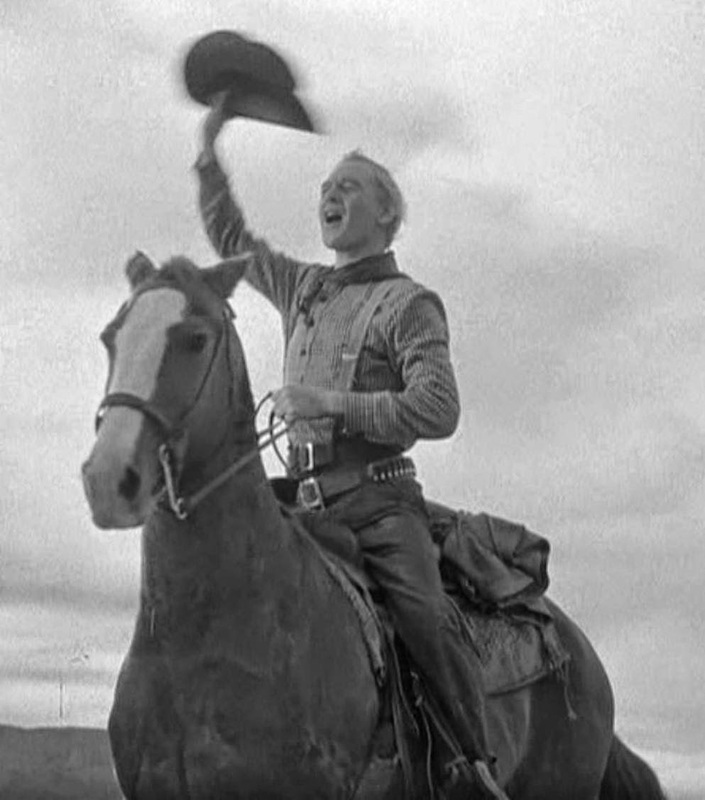 Ben Johnson on Steel in Wagon Master (1950). Ben Johnson rides Steel, a sorrel stallion owned by Johnson’s father-in-law Clarence “Fat” Jones. The Fat Jones Stables supplied many of the horses used in countless Hollywood westerns. Steel was one of his star horses, very calm and able to consistently deliver for demanding film crews on tight schedules. Steel was a handsome chestnut horse with a distinctive white blaze down his face. Some of the biggest names in town—John Wayne, Gregory Peck, Randolph Scott, Joel McCrea, Henry Fonda, and Clark Gable—rode Steel and he made them look good. But everyone knew he was Johnson’s horse. Johnson rode Steel in She Wore a Yellow Ribbon, Wagon Master, and Rio Grande and even took him out for a turn on the rodeo circuit. Ben Johnson on Bingo in Wagon Master (1950). Like most stars, Steel had his own stunt double. 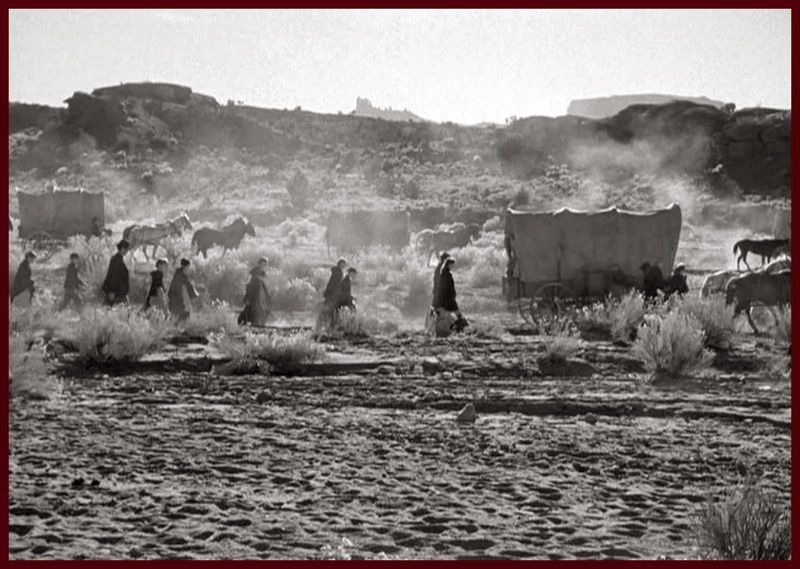 For a major chase scene, like the one where Johnson is pursued by a band of Navajo in Wagon Master, Bingo was brought in for the honors. And Bingo can MOVE! 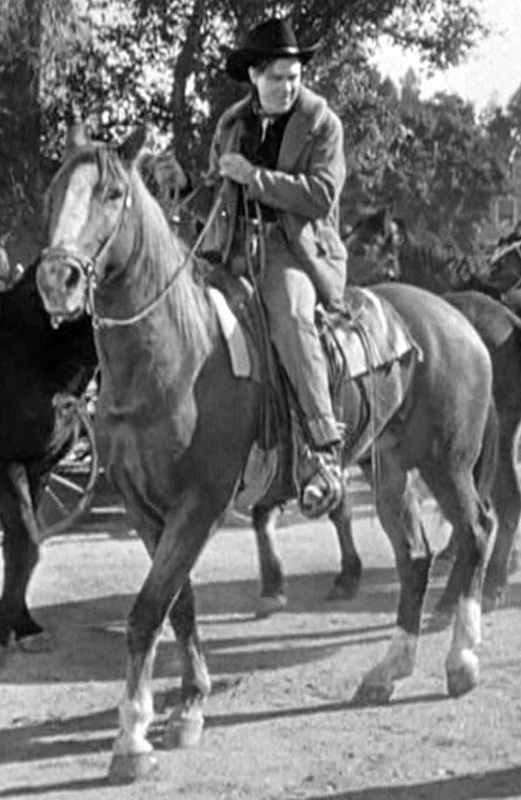 Harry Carey, Jr. on Mormon in Wagon Master (1950). The dog photobombs the credits. It’s not all horses in Wagon Master. Dogs add to the excitement, too. 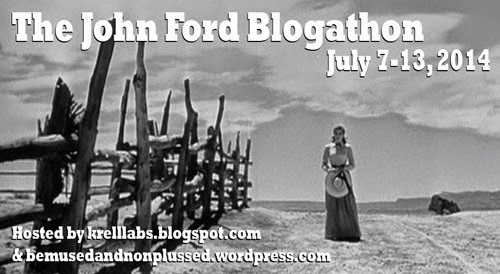 In order to insert a little more action to a shot, John Ford loved to show a dog dashing across the screen. Wagon Master is full of dogs. 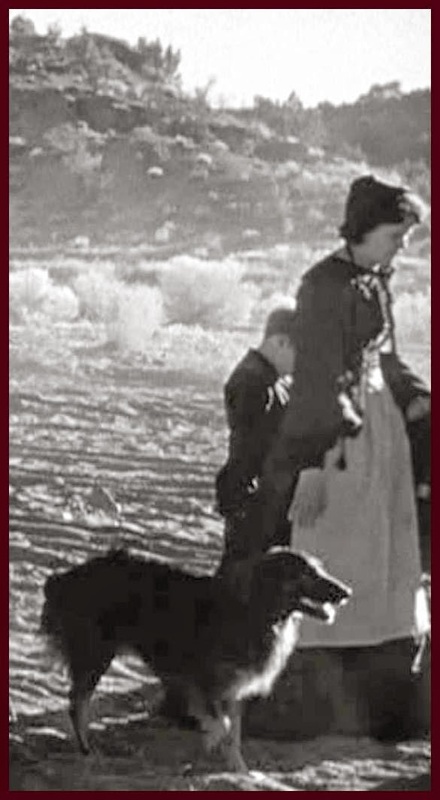 In fact, the dog theme is introduced in the credits, when a beautifully composed image of a turning wagon wheel is photobombed by one of the dogs. That’s just the beginning of their canine scene-stealing throughout the movie. Dogs meant family for Ford; if the wagon train was carrying dogs, it meant there were good families on the move. Ford bought it on the spot. “I need that song abut the ghost town—the one you just sang—for my picture.” And then Ford asked for three more in the same vein, which Jones quickly delivered on. “Rollin’ Dust” is sung at a low point in the journey, accompanying an atmospheric slow montage of blowing dust and bone-tired people. filmed by cinematographer Bert Glennon. I blog over at wordpress. Did a review of Wagon Master a couple months ago for our local newspaper, which carries my blog. My Friday posts are dedicated to Classic Movies, which I don't believe enough young people know about. Enjoyed your post so much, especially the info about the horses-Bingo better have gotten extra wonderful treatment after that chase scene! I am so happy with the screen capture I managed to get of Bingo in action. In most shots, he's just a blur! I think (not entirely sure) that the white blaze on his forehead is a makeup job to make him look more like Steel. 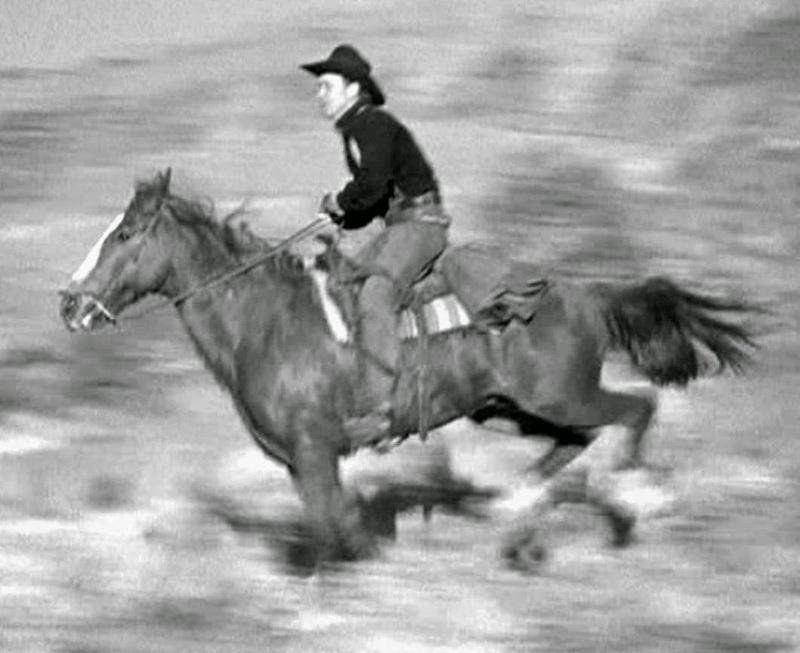 Bingo did the jaw-dropping chase scene in She Wore a Yellow Ribbon, too. Amazing horse! Thanks for your kind words! Thanks for this enjoyable review! I particularly enjoyed the checklist and details about Steel's history. You're welcome! It seems like everyone respected Steel. Harry Carey said you could light a firecracker under him and he wouldn't buck! There's a brief remembrance of Steel in this YouTube clip of an interview with Robert Mitchum's daughter, who wrote a great book (Hollywood Hoofbeats) profiling Hollywood's greatest horse stars. This is an utterly charming article. Your grandmother could have been an honorary member of an unofficial club that includes myself and a couple of other gals who get peeved when TCM and the like start advertising western movies as "perfect Father's Day gifts". Where were they on "Mother's Day"? Caftan Woman, maybe they're thinking that it was mainly the boys who used to play cowboys and Indians? But in my neighborhood, it was the girls who really took to horseback riding. And love of the frontier (and enjoyable stories) seems to cut across both genders. 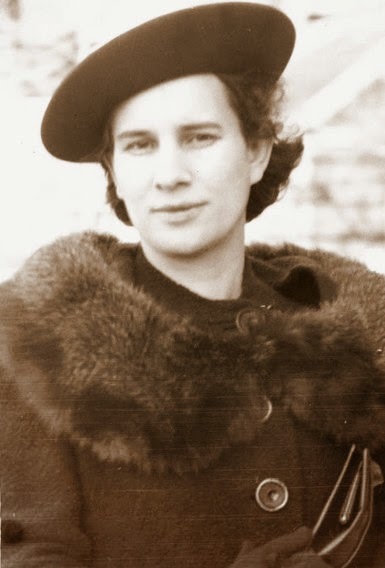 I bet you would have liked my grandmother. She loved a good movie!